So I thought I found one in Salem Oregon, but they sold it yesterday! Was that someone on the forum? It went for $550. I thought I had another one in Tacoma, but they crushed the car after only removing the stereo and the motor!! unbelievable. So far that's it. Alot of wreckers have the parts mis-catalogued so its not a straightforward search. If anyone has a lead on a used unit please send it along, The gasser i'm currently driving is giving me trouble so I need my i-Miev back on the road ASAP. as an aside I wonder if the latest iteration of the inverter is more robust? It has one connector that is different as well as no filter on top. 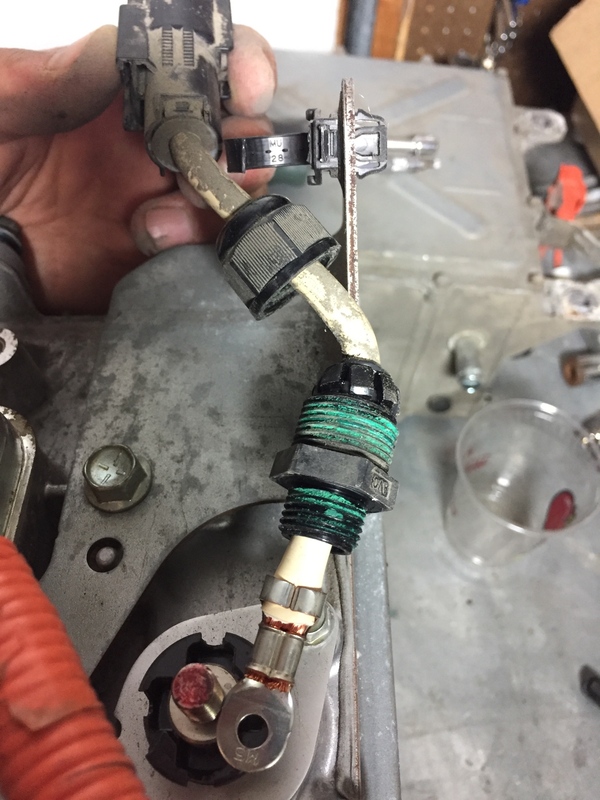 Where does the connector in the photo attach? 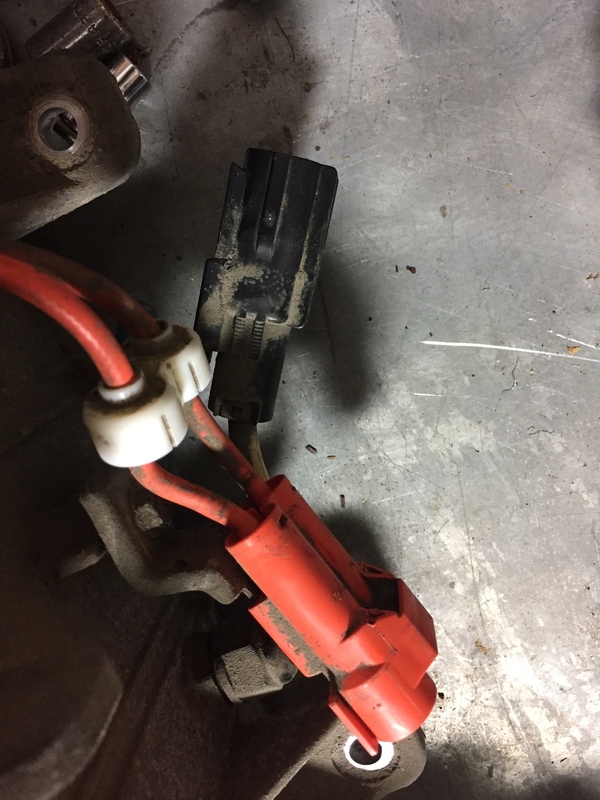 My local dealer told me this new charger was the most current part # but I’m not sure that it is going to be able to be installed with the older Ecu. 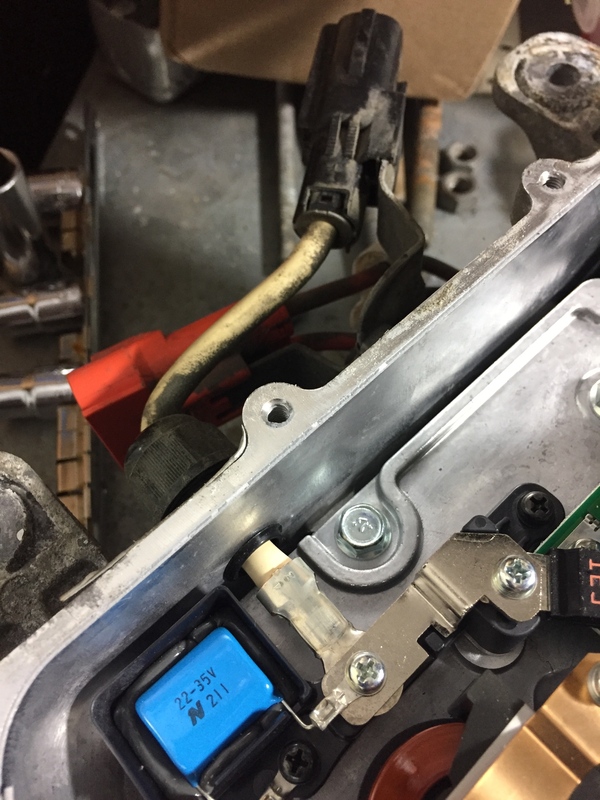 The ECU has different ports and the big orange cable from the inverter plugs into the right side of the ECU. And that is where I have run into a problem. 1pk wrote: It has one connector that is different as well as no filter on top. I've noticed that a lot of chargers don't have the extra EMI filter box on top. I haven't checked, but my impression is that the newer ones don't tend to have them. I assume it was put on as an extra-safety afterthought or to meet some regulation, and now is considered an unnecessary extra cost. 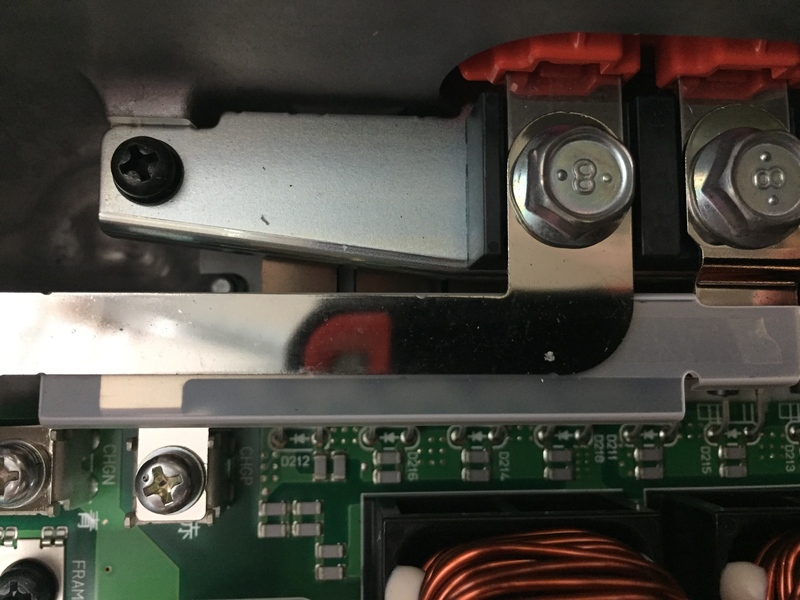 Does anyone with a newer imiev feel like disconnecting the orange connector from the front of the inverter and posting a picture of it? I'm wondering if the connector coming from the MCU will fit! I’m hoping that with all the tracing you’ve been doing you can tell me what these orange cables do? They connect to the ECU in my 2012. 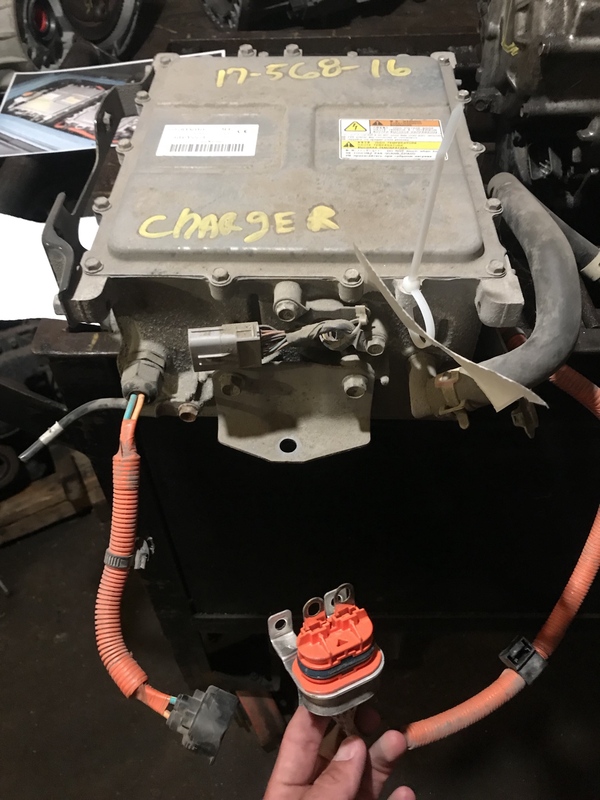 The updated 2013 charger and ECU look different and have a different connector. My “new” charger has this different connector but I am hoping the wiring is the same and I can change the connector and plug it in. Those thick orange wires are the output high voltage of the charger. 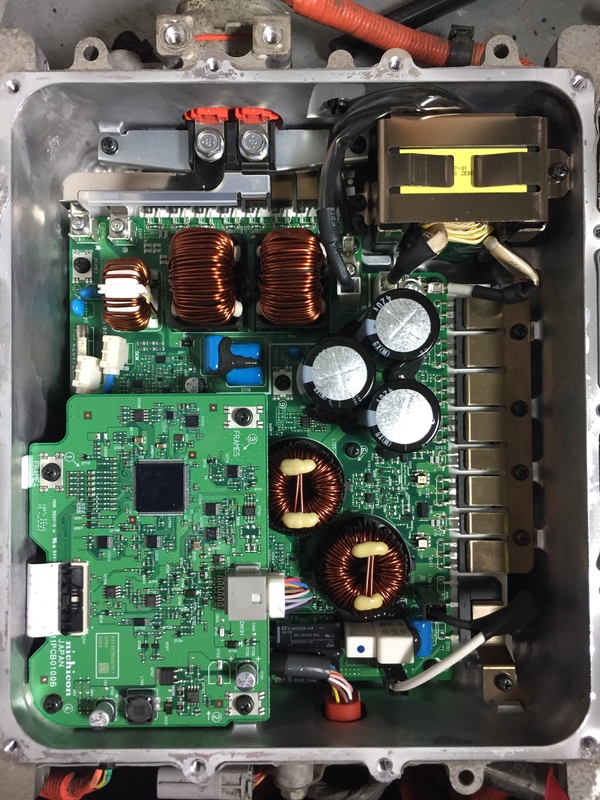 They run over to the positive and negative terminals of the battery pack located beneath the small access panel in the Motor Control Unit, MCU. There is a connector between the two boxes to make it easy to install and disconnect, etc. Kiev, my new charger has a connector like this. It plugs directly into the side of the newer style MCU from the 2013 and later cars. I assume Because it’s just power It should be compatible And i just need to connect it somehow. Does that sound reasonable? Two of the four connectors are the same and I'm hoping that the other two connections can be made to fit. 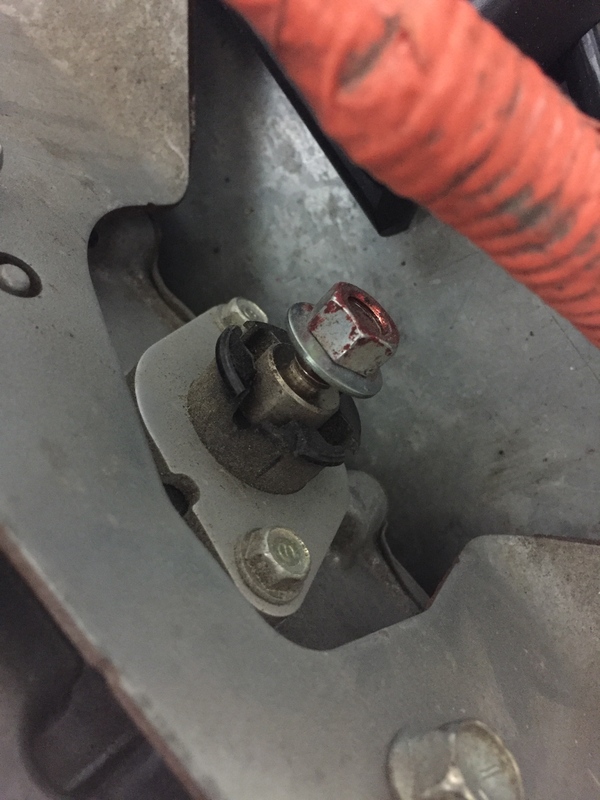 The black connector in this image has been replaced with a bolt. Kiev, what's it for? And this is the new high voltage cable connector. It's the same at both ends. Tomorrow I will have a crack at connecting things up. Any advice is appreciated as I am WAAAAY out of my element. Wow! Really different. But still Nichicon, so hopefully essentially the same circuit. Looks like it might be easier to pull apart and repair, too. 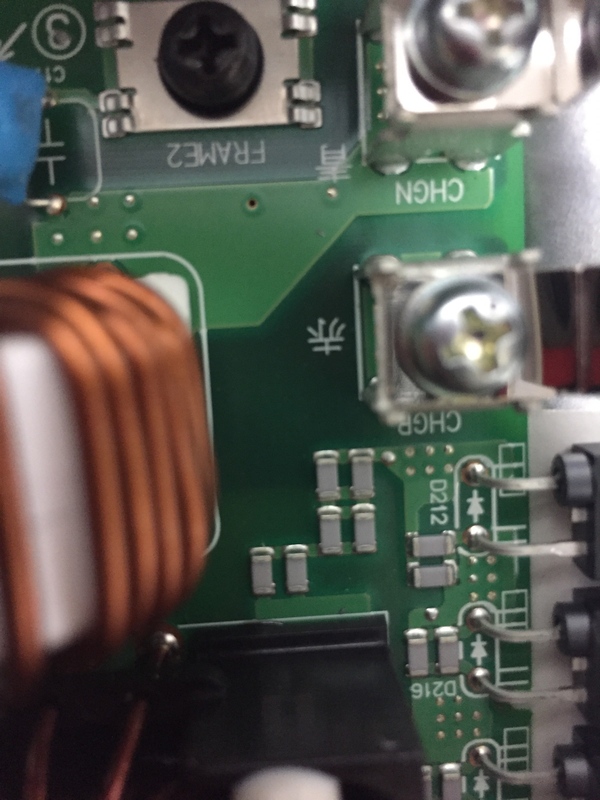 That has to be the 12 V output from the DC-DC. You might have to crimp an eye terminal to the thick white wire that leads off to the 12 V battery. Disconnect battery negative when you work on that, or be careful to avoid splats. 12 V will return via the case, so ensure that there is a good path to the metalwork. Just be sure to connect positive to positive and negative to negative. Of course, have the battery isolated when working on that. That will be charger output Negative and Positive, respectively. The connections are pretty easy: mains in, 12 V out, and 350 V out. It's mainly a matter of getting things to reach, be safe, connections to be tight, and be waterproof. Some neutral cure (important!) silicone sealant might come in handy.